With a throughput of 10,000 TPH <40mm lump iron ore, excessively high wear rates were resulting in lost production and frequent maintenance outages to replace original wear materials. Large investments in exotic weld overlay plate by the client in an attempt to reduce wear rates to acceptable levels proved an unsatisfactory return-on-investment (ROI) with exotic weld overlay lasting only 7 weeks and attempts to increase ROI from patching the plates failed. 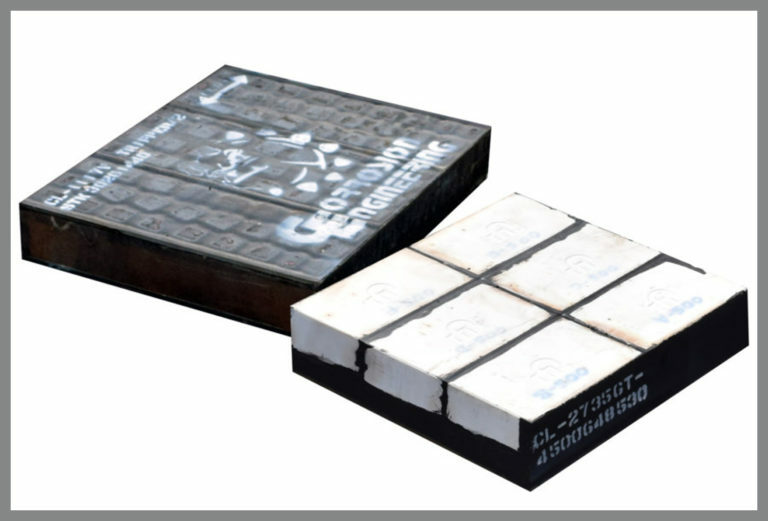 The customer trialed competitor ceramic tile liners and ceramic cube liners, both of which failed after only 8 weeks in service. The highly abrasive material required a lining system that had the ability to extend wear life significantly, while also being easy to install. In consultation with the client, a CorroCube wear lining system was developed and designed to achieve maximum wear life and cost efficiency while facilitating easy installation. In May 2006, the original CorroCube wear lining system significantly extended the uptime of the plant to 24 weeks and over 20 million tons resulting in huge savings for the client. After 4.3 million tons, ultrasonic thickness measurements of our 44mm thick ceramic cubes were taken where the most worn point had 33.4mm remaining. Through consultation with the client and observing wear patterns, the CorroCube lining system was modified for ease of maintenance and to maximize wear life and cost efficiency. After numerous failed trials of other wear materials, and a painstaking loss of productivity, CorroCube was proven to be highly cost-effective with a lining system in May 2010 operating in service for 27 weeks and in excess of 24 million tons. Through wear surface management inspections and ultrasonic thickness testing, the CorroCube lining system installed in these identical chutes maximized wear life and productivity while minimizing labor, and outperforming a variety of other wear materials.